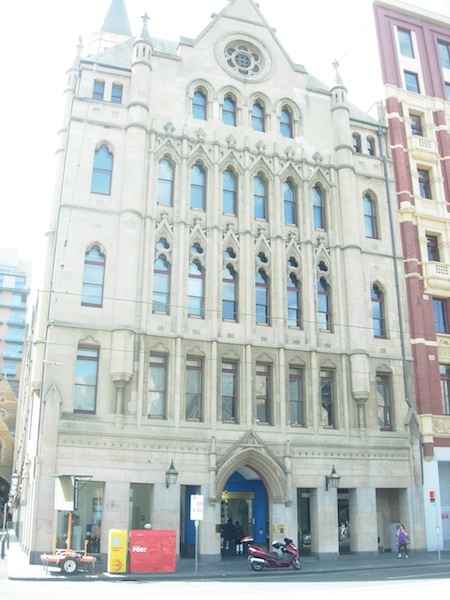 The former Metropolitan Gas Company building is located at 194 Flinders Street in the Melbourne CBD. It is opposite St Paul’s Anglican Cathedral and was designed by Reed, Smart and Taplin in the Gothic Revival Style to harmonize with the Cathedral. It was completed in 1892, the year after the Cathedral was consecrated. Joseph Reed (1823-1890), part of the team that designed the Metropolitan Gas Company building, supervised the work on Cathedral after the original architect resigned in 1888. Originally in red brick, the façade of The Metropolitan Gas Company building was resurfaced in synthetic stone in the 1930s. The building features pointed arches, lancet windows with tracery, columns, a large square tower and smaller round towers topped by finials, and a stately pointed arch entrance with moulding. 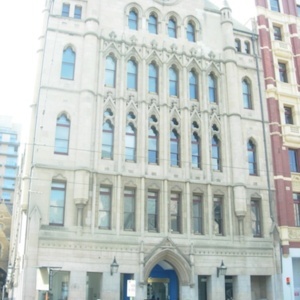 “(Former) Metropolitan Gas Company building, Melbourne, Victoria,” Medievalism in Australian Cultural Memory, accessed April 23, 2019, http://ausmed.arts.uwa.edu.au/items/show/1306.